World famous Dal Lake that unfortunately is shrinking and an indifferent attitude by occupiers has rendered it into a dump of weed. Migratory birds travelling from as far as Siberia, natural habitat and all wild life have already become endangered due to one million armed to teeth Indian infantry divisions playing havoc with the ecology of this little paradise. Most of Kashmir´s farmland is under intense cultivation, producing corn, wheat, rice and saffron amongst other crops. Fruit and nuts are also produced in quantities including pears, apples, walnuts, cherries, apricot and almonds. Kashmir is famous for its exquisite handicrafts like woollen and silk carpets, felt Numdha rugs, Chain stitch rugs, pin point tapestry, crewel drapery and huge lot of other items. It is a treat for animal lovers and bird watchers to visit Kashmir and apart from the local habitat, animals and birds, you get to watch vareity of migratory birds from Siberia. Occupational uniformed strong men, heavily armed, contribute to political unrest and Kashmir's ecological balance that is severely disturbed due to unabated environmental destruction over a period of six decades. Temperatures in the valley risen, diminished rain and snowfall, deforestation and mismanagement of water resources resulting in soil erosion which experts term as responsible for frequent flash floods. Dal Lake seriously effected due to attenuated supply of ice cold water from mountains and lack of maintenance adding to the pollution. The rich wild life, leopard, snow leopard, black bear, Hangul etc. are the species of the past as these are extinct like the special specie known as 'the human being'. As the winter sets in, Hokrsar 14 kilometres north of Srinagar the capital city of Kashmir is home to migratory birds; visitors from Siberia and other regions of Central Asia, a thrilling experience for locals and tourists alike. History tells us that the delegations of 14th century Sufi Saints from Iraq and Central Asia were greeted and warmly received by local population to accept Islam as a way of life and Kashmir a home to scores of Sufi Saints is reverently referred to as Pirwaer (Abode of Saints). People groomed spiritually are intrigued to see these birds and consider them as venerated natural guests. The so called unpopular Games hunting of birds or habitat for sports before the times of military occupation was unknown to local population. 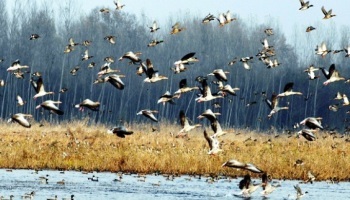 Kashmiri officials of Wild Life Department at Hokrsar assert that comfortable climatic conditions, better protection and the easy availability of food in the region are the prime reasons behind the massive migration of these birds. It is estimated that, during the winter, over 900,000 birds migrate to the reserve. Hundreds of thousands of exotic birds such as Mallards, Greyleg Geese, Gadwalls, Teals, Shovellers, Pochards and Coots are reported making their temporary nests every season. However, a very high concentration of military presence armed with sophisticated weaponry has adversely affected the climate due to felling of trees, easy bird-hunting for food resulting in ecological collapse and imbalance. Kashmir is a sojourn and dwelling to exotic and beautiful rich wild-life; snow leopard, Markhor (Wild Goat) Cheetah, clouded leopard, black bear and the national animal Hangul(A specie of Stag family found only in Kashmir). 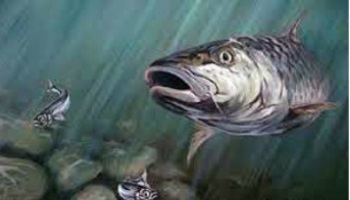 Most of these species are extinct as the practice gunfire or actual combat has either consumed them or are chased away. Some sections of Indian society find the wild animals a delicacy to feed on and believe the meat of these animals to have aphrodisiac effect which causes the arousal of the mood of sexual desire. 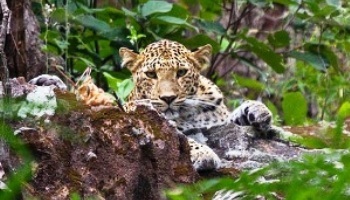 An Indian drafted report on Kashmir�s wild-life attributed to some forest guards of Kashmir gives a rosy picture of wild-life protection, conflict management program giving details of earmarked area notification as 15912 sq.km, national parks, wild life sanctuaries and conservation reserves managed on scientific basis, a very encouraging scenario. 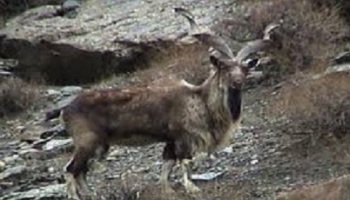 The total Markhor population officially claimed to be around is just 50 and all other species of wild-life habitat enriching the environment in the past has not been mentioned anywhere and no one knows if the species really do exist. Forest denudation, felling of trees has been a major concern for locals and the timber illegally exported to Indian cities transported in empty trucks initially convoys carrying in military hardware supplies for Indian army stationed in every nook and corner of Kashmir State. It is an accepted norm in the army that huge bribes are paid by army personnel for a posting in Kashmir as the job apart from double or treble salary, the income from �other sources� is more than welcome. Thousands of returning supposedly �empty trucks� are immune from any search and cannot be stopped at any Custom, Octroi or a Check-post. The waste generated by army and its Para-military troops is unprecedented and the disposal of such a waste is beyond the means of the local government. The widespread army presence, especially in sub-zero temperatures, in order to keep themselves warm due to lack of facilities in remote areas enhances the need to axe the forests at the cost of Kashmir�s environment. The live-stock, vegetables and other foods for which Kashmir was self-sufficient before the occupation is now totally dependent on imports from Indian cities leading to a drain on local resources and enriching the economies of Indian cities. Kashmir predominantly a rice-eating nation self-sufficing now imports rice from India. It is noteworthy that Kashmir has the capacity to grow enough paddies to meet its internal requirement and the surplus can feed a few states of north India. Kashmir�s healthy world famous orchids growing apples, grapes, apricot, cherries, almonds, figs, walnuts to name the few and scores of other fruit plants have been attacked by unknown disease Scab (crustlike lesions on the affected parts caused by a fungus or bacterium). It is widely believed that the diseases, intriguingly, were imported from outside to promote the produce available elsewhere in India. The only match factory, pride of Kashmir running successfully in Baramulla, 40km from the capital Srinagar was closed way back in early fifties and since then any other industry or factory worth the name is an effort made by locals under the scheme self-help and are struggling. In order to create a comparison, Kashmir�s small hilly province Jammu has reasonably good industrial development as all the help, financial, raw-material and know-how provided is considered as a safe investment due to common ethnic bond and faith. More than a million strong army; deployed in Kashmir is to keep a vigil on all civilian dwellings so that the populace does not venture out to repeat 1989 two million long march to UN office to register their political grievances. The claims of returned peace does not seem to be enough to remove army bunkers facing residential houses in every street, lanes or by-lanes. Indian defense minister Shinde conveniently calls it chhota motta teeny-weeny peace which, according to the minister, is not enough to remove army. Kashmir�s Wild Life Department in a desperate bid offers one to two hundred thousand Rupees to help capture national animal Hangul, critically endangered found in Kashmir only, for breeding centres to save the animal from total extinction. Heavy concentration of armed forces on a high altitude snow-clad mountainous range, icy glaciers and springs provide an opportunity for games, hunting and flesh to satiate the hunger full of proteins at the cost of the habitat like snow leopard, leopard, black, red bear, Markhor (wild goat) and other animals. The technologies available to protect such animals through breeding programs do not apply to Kashmir as paucity of funds and continuous use of gunfire makes the process difficult and at times impossible. The proven scientific factuality tells us that wildlife maintains ecological balance and shapes forest ecosystems. All living organisms in their natural habitat form a vitally important and inseparable part of human existence maintaining the natural cycles. Deforestation and felling of trees for trade, endangered species targeted through poaching, games, economic benefits, religious compulsions and in many cases forests and far-flung high altitude areas occupied by armies due to political reasons play havoc with the heritage and harmless species living around. The local Wild life conservation attempts, a top priority using best available technology, embark on preserving and improving on the methods to safeguard the habitats as pragmatic approach like re-wilding is increasingly used to get positive results. World over resources on huge levels are expended for reforestation, pest control, irrigation, coppicing and hedge laying. Unfortunately there are areas where politics and petty economic considerations play a role and contribute heavily in depriving the world of ecology, climatology and geography to fulfil some political expansionist ambitions. On the contrary, in the United Kingdom for instance, millions of Pounds are spent for the management of wildlife and charities such as RSPB (Royal Society for the Protection of Birds) and various other Wildlife Trusts committed to preserve forestry and natural habitat. A lot has been said about politically motivated soaring numbers of Yatris (religious travellers) from India visit to the glacier "Amarnath cave" when a whooping half a million devotees go in and out of the cave in one month termed as a miracle that "the lingam lasted that long". The visited glacier situated in round the year snow clad mountains of Kashmir is nearly 13000 ft above the sea level and the below zero temperatures are instrumental in maintaining the natural shapes and sizes of the glaciers. The surging numbers of devotees is a recent phenomenon understood by Kashmiris as another attempt to intimidate and harass the local population, a sinister design dangerously poised to create environmental hazards with the basic intent to change the demography. The lack of waste disposal system, along the routes and breath-taking glacier natural sites, not in sight makes it a dumping ground for littered plastic bottles, wrappers, non-biodegradable pollutants and widespread human excreta of half a million humans turning the paradise into some kind of visible hell. In this context the local Kashmir administration reported that "Instead of acting on the recommendations to reduce the number of �devotees� to the cave to save the environment the Hindu religious board displaying stubbornness responded with increasing the number of visitors from India, not only endangering the ecology but also the cave itself". Swami Agnivesh, social activist and a civil society member revered and respected all over India advised Hindus not to visit Amarnath cave in huge numbers at the behest of Hindu extremist organisations. He stressed the point that Hindu zealots push hundreds of thousands of hysterical Hindu devotees into Kashmir to give an impression that Kashmir is an integral part, terming it as religious terrorism. Kainaat Mushtaq from Kashmir reports that Mahseer (Mahsheer) the traditional migratory fish, scientifically known as Tortor, became extinct as "construction of a Dam in Kashmir held by Pakistan blocked the natural flow of these omnivorous red-finned fish". Its huge size reaches up to 2.75 meters weighing up to 54 KG, she added. The pride of Kashmir Mahsheer and world famous Trout have become a victim to uncertain political situation created by occupational forces creating an environment of spiralling violence. Kainaat, perhaps unaware of the topographical and geographical boundaries of divided Kashmir missed the fact that the water flow of river Jhelum has its source in Kashmir held by India and not the vice-versa. So Mahsheer of the size and weight, as mentioned, would not travel upwards and backwards against the current of the river. Hindustan Times, April 07, 2014) reports that a retreating frightened leopard was shot dead by Indian army in Kashmir and as claimed the animal had injured army�s six other colleagues. The professional photographer�s camera catched the drama showing the hapless leopard running away in vain to avoid the inevitable. 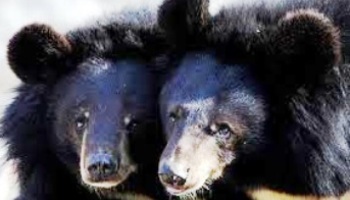 In recent years, Kashmir witnessed wild animals like bear, leopard or even wolf move down to the residential areas putting life of inhabitants and even of animals at risk. 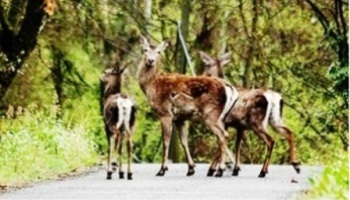 A retired official of Kashmir�s wild life department wishing not to be named told onislam.net that "These wild animals were becoming a regular scene in summer and autumn, during which bears come down towards the crop fields while the leopards are seen round the year. Most of these animals are killed after they are caught thereby facing decline". The question debated is that why do these animals come down to villages and cities? The simple concluded answer to the question is that unwanted and uninvited heavily armed humans have forcibly occupied their domains to drive them out. Snow Leopard found around high altitude snow clad mountains have paid the price for its breath taking marking on the skin. The lovers of environment all over the world must join hands with like minded souls to condemn the deliberate damage done to this paradise on earth.